Remember last week I said there would be two winners this month to win approximately a metre of fun Christmas-themed fabric each? Congratulations girls, and thanks everyone for joining in this month….looking forward to what we have in store for October…don’t forget to add the date to your calendars. Congratulations to the winners and thank you, Wendy for organizing it. It's a lot of fun visiting all the blogs to see what everyone was up to! Thanks so much Wendy - cant wit for my little gift to arrive....mightn't make it into a project this year but there are always Christmas things happening. Thanks to everyone for their company - hopefully next month will be more productive and I can get back to reading all my usual blogs...been so busy lately. 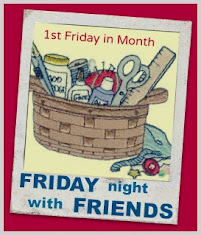 I'll be spending some time on Tues morning visiting FNSI links. Congratulations ladies. Enjoy your win. Thank you Wendy for our FNSI again this month. Congratulations ladies, enjoy your fabric and create something fabulous. Thanks Dear Wendy it was a good night congrats to the winners..